Jay Watts is a 1985 graduate of the University of South Carolina College of Pharmacy. Jay has owned and operated Aiken Compounding Pharmacy founded in 2003, Family Pharmacy in South Aiken founded in 2009, and Family Pharmacy on Newberry Street founded in 1986. He has been voted Aiken Standard’s Best of the Best Pharmacist several years in a row. His areas of cognizance and passion include traditional pharmacy as well as Bio-Identical Hormone Replacement Therapy, Iontophoresis & Phonophoresis compounding, Veterinary Compounding, Pain Management, and Hospice Care. He is certified in general and advanced prescription compounding as well as general and advanced veterinary compounding. Jay has been a Fellow of the American College of Apothecaries since 1999 and served as the President from 2012 to 2013. He is also a Fellow of the American College of Veterinary Pharmacists and served on the board of directors. 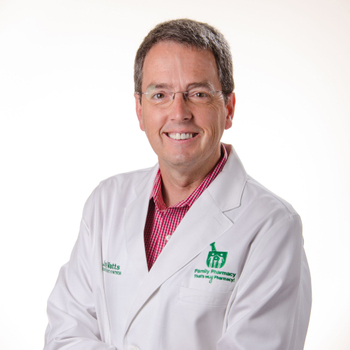 Jay is a lifetime member of the National Community Pharmacists Association, a member of the International Academy of Compounding Pharmacists, and a member of the South Carolina Pharmacists Association. Jay and his wife, Sherrie, are proud parents of 4 adult children and 2 precious granddaughters, Alexandria and Charley Rose. In his free time, Jay enjoys traveling, photography, and working in his yard. He attends Cedar Creek Church in Aiken. Let us know how you enjoyed your pharmacy experience here at Family Pharmacy.